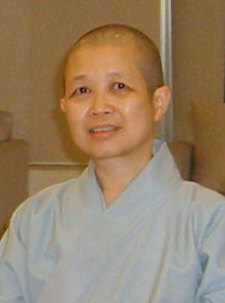 Bhiksuni Chao-hwei Shih was born in Yangon City, Burma in 1965. She moved to Taiwan when she was 8 years old. She completed high school with honors and was the valedictorian of her class. She attended Taiwan International Normal University and ordained. Bhiksuni Chao-hwei Shih began to teach Chinese and Buddhism in various colleges and also Religious Studies at Hsuan Chuang University, where she is currently a professor. In 2004 she founded a Research Center for Applied Ethics. And now serves as the Dean of Graduate Studies at Hong Shih Buddhist College. A leader of social movements at the national level she promotes Kwan Yin statues, and Vesak Day as a public holiday. As founder of the Life Conservationist Association, she lobbies for animal rights legislation, and is the author of numerous manuscripts on Nature Conservation. Bhiksuni Chao-hwei Shih lobbied His Holiness the Dalai Lama of Tibet for the full ordination of women monastics of the Vajarayana lineage, and she organized an event to formally Abolish the Eight Garudhammas, gathering the four-fold Sangha to participate. An author of 25 books and over 40 research papers, Bhiksuni Chao-hwei Shih received the 48th Chinese Literature and Arts Medal.